Have you ever been working at your desk in your office, or in the back of your store or shop -- and looked up to see a customer standing in front of you? Chances are, your office door was not clearly marked as Private, Staff Only, or Employees Only. Some of the most effective signs are the ones posted by doorways that let anyone know if it's a door they want to, or should, open. 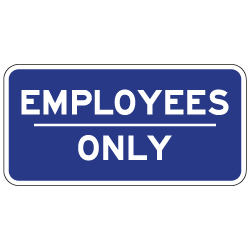 An Employees Only sign helps guide customers and visitors around your store, shop or business. In some customer environments, such as auto repair shops, having customers in Employee Only areas is not just an inconvenience, but unsafe. There is a reason insurance companies offer more favorable rates to businesses using Employee Only signs to keep customers from entering potentially dangerous work areas. STOPSignsAndMore.com not only keeps important room identification signs in stock, we can also make custom room name signs for your business. It only take us a few days! DOUBLE the working life of your Employees Only Signs by adding 3M Protective Overlay Film (POF)! 3M’s high-tech POF protects sign faces against fading caused by the sun and harsh weather—and makes graffiti and sticker defacement damage easy to clear away without harsh abrasives.